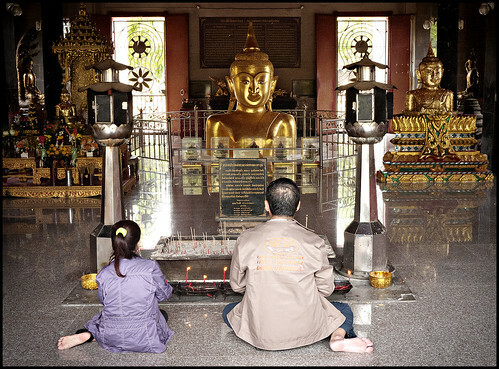 Back in 2006, on the same day we visited Wat Sri Sunthorn, we also found Wat Phra Tong for the first time, which was actually our main aim for the afternoon. Pra Tong temple is fairly well known and is mentioned on many Phuket web sites, but owing to its location in Thalang (quite a way from any main beach) it's not visited nearly as much as Wat Chalong, though on the few times I have been since, I have seen a steady stream of Thai visitors coming to see the famous "Half Buddha" statue. 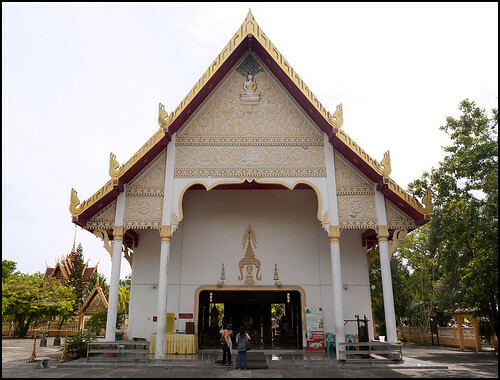 I know that, in general, temples are not top of the list for visitors, but in the Thalang area you can stop off here, Wat Sri Sunthorn and Wat Phra Nang Sang which are all close together. I'm not sure that "temple tours" would really be too popular, but this is Jamie's Phuket and I like temples! Wat Phra Tong is on the northern edge of Thalang Town, down a clearly signposted side street to the east. If coming from the south you need to u-turn and head back south. There is plenty of parking .. Space for buses too, as it's busy on certain holidays. There are several temple buildings and a museum. The temple housing the Phra Phut image doesn't look like much from the outside. The temple has quite a story attached to it. It's not clear exactly when, but the story is of a boy who tied his buffalo to a post sticking out of the ground. The boy became sick and died. It was found that the post he had tied the buffalo to was the top of a buried Buddha image hidden in the undergrowth. The buffalo was also dead. The villagers tried to dig up the Buddha, but could not. Those who did not say prayers got attacked by wasps, hornets and bees. 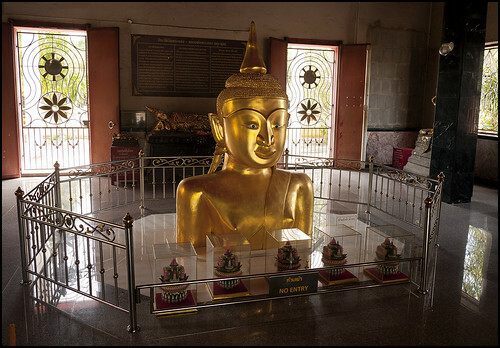 The governor ordered the people to cover the image with gold and to build a temple around it. 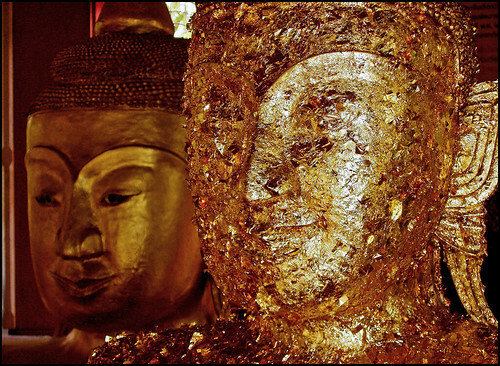 (above) The actual original Buddha image is not to be touched - but you can rub gold leaf on a replica image ... and, as you can see, many people do! The museum is a collection of "old stuff" ... I did go inside one time, and for a collection of old bits and bobs it's not too bad, got to be worth 10 minutes of your time. Outside the museum is a reminder of Phuket's past - in particular the Thalang area which was the main inhabited area of Phuket for hundreds of years until the mid 19th century when tin mining led to Phuket Town and Kathu becoming more important. 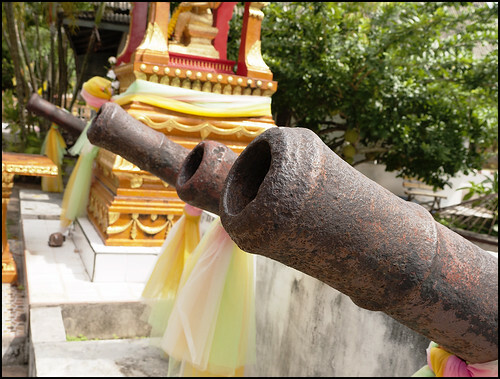 These cannons (below) may once have been used to fight off Burmese invaders in the late 18th century.